U2 Vertigo//2005 is without doubt the hottest tour of the year! Ticket demand has been phenomenal and by the end of 2005 U2 will have played to 3.25 million people! Vertigo//2005, U2 Live From Chicago the DVD captures this unique experience. 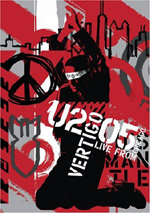 Vertigo//2005, U2 Live From Chicago features 23 electric performances, with songs drawn from across the bands entire career - from first album fan favorites such as "Electric Co," through U2 classics such as "Pride", "New Years Day" and "Where the Streets Have No Name" and right up to date with "Vertigo" the smash hit that launched this years #1 studio album "How To Dismantle An Atomic Bomb". Am I the only one stunned to consider that U2 released their first album 25 years ago? This seems amazing partly because many folks still see them as a “young” band. Think about it: 25 years after the release of the Stones’ first album, they were regarded as elderly dinosaurs. People hooted at their 1989 tour – which was 26 years after their earliest album – and called it “Steel Wheelchairs” since Jagger was at the advanced age of 46. Bono is 45 but no one seems to view him as ancient. This is probably because the Stones, McCartney and other sexagenarians still perform. Since they’re still around, they broaden our definition of “old rockers” and make all the others seem young by comparison. In any case, it does appear remarkable to consider that U2 have been around so long, and they show no signs of letting up anytime soon. Why would they when they can move concert tickets like few others in the business? Their 2005 US “Vertigo” tour sold out virtually everywhere it went and became one of the year’s top outings. Did it find the band at their best? Unfortunately, no. While a perfectly solid tour, “Vertigo” won’t go down as U2 at the top of their game. As I write this, I’ve seen them 17 times this year, with my 18th – and presumably final – show in a few days. I’ve enjoyed the shows, but they don’t compete with superior tours like 1997’s “PopMart” or 2001’s “Elevation”. I discussed my thoughts about those in detail elsewhere so I won’t belabor them here. However, “Elevation” will have to come up again in the conversation because “Vertigo” so strongly resembles it, and that creates one of my biggest complaints about the 2005 tour. Examine each U2 tour from 1987’s “Joshua Tree” through “Elevation” and you’ll find a series of very different shows. (I have to omit the brief 1989-90 “Lovetown” concerts simply because I didn’t see them live or on video so I can’t comment on their construction.) The band went from the fairly stark visual presentation of “Joshua Tree” to the multimedia-gone-mad world of 1992’s “Zoo TV”. From there they took consumerism to the max with 1997’s “PopMart” and then scaled things down with “Elevation”. The latter featured one feature new to U2: a stage with a heart-shaped ramp that enclosed part of the audience on the floor. Otherwise, it used video screens and occasionally dropped thin scrims for most of its visual elements. Based on all that change over the years, one reasonably would expect “Vertigo” to create a new and different stage environment. That wasn’t the case. Instead, U2 did little more than recycle the “Elevation” presentation. They made the ramp oval instead of heart-shaped and featured curtains of lights instead of scrims, but otherwise, it felt like 2001 all over again. This fact doesn’t make the shows bad, but it remains a disappointment. Perhaps U2 intended to send a message: “We used to be hung up on the visuals, but now we only care about the music”. Given the moderate glitziness of the stage, that wouldn’t make sense, but it’s a possibility. I don’t know if anyone in the band ever commented on the similarities between the tour tours, so for now I have to speculate. Despite the similarities between the two stages, “Vertigo” did update the setlist. Unsurprisingly, the biggest changes came from the inclusion of many tracks off of 2004’s How to Dismantle an Atomic Bomb. U2 played quite a few numbers from it each night, eight of which appear here: “City of Blinding Light”, “Vertigo”, “Miracle Drug”, “Sometimes You Can’t Make It On Your Own”, “Love and Peace Or Else”, “All Because of You”, “Original of the Species” and “Yahweh”. They retained a couple of All That You Can’t Leave Behind songs as well. That was the album spotlighted in 2001, and we got “Elevation” and “Beautiful Day”. The rest of the set mixed hits with surprising choices. From the early days, we found 1980’s “Cry/Electric Co.” and “An Cat Dubh/Into the Heart”, none of which appeared live much for the last few decades. The band’s traditional show-closer in the Eighties, “’40’” reasserts itself for the first time in many years. Joshua Tree’s “Running to Stand Still” pops up after many years’ absence; I don’t think it’d been played much – at all? – since “Zoo TV”. Another rarity came from Achtung Baby’s “Zoo Station”; a highlight from that 1991 album, it’d also not shown up since “Zoo TV”. Otherwise expect well-known tunes. We got a trifecta of Achtung hits with “One”, “The Fly” and “Mysterious Ways”, and a couple of notables from Joshua Tree showed up via “Bullet the Blue Sky” and “Where the Streets Have No Name”. (“Bullet” wasn’t a hit, but since U2 have played it at almost every concert since 1987, so I can’t exactly call it a “surprise”.) 1984’s “Pride (In the Name of Love)” popped up along with two 1983 classics: “New Year’s Day” and “Sunday Bloody Sunday”. 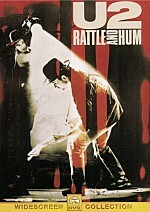 The performances on this DVD come from two Chicago shows shot May 9th and 10th, 2005. Why those concerts? For one, Chicago has always been a U2 stronghold, so it makes sense from that point of view. In addition, May 10th is Bono’s birthday – and mine, incidentally – so the shows had a special value to them from that point of view. The DVD mix and matches the setlists, both of which were mostly quite similar. U2 played identical main sets both nights, but the encores differed. “Yahweh” and “’40’” popped up on the 9th, while “Original of the Species” was exclusive to the 10th. The band also closed the second show with a reprise of “Vertigo” that doesn’t appear here. Otherwise, the only omission comes from the absence of “Party Girl”. Bono brought a girl from the crowd to play guitar on it both nights, but neither performance shows up here. The setlist is very representative of the performances given during the first leg of the 2005 tour. The band always finetune things over the weeks, so you’ll see quite a few differences if you look at current (early December 2005) concerts. “New Year’s Day” got the boot months ago, and “Zoo Station” and “The Fly” appear much less frequently. “Mysterious Ways” shows up sporadically, and the “old oldies” slot occupied here by “Electric Co.” and “An Cat Dubh” has been shortened to one song if it appears at all. “Miracle Drug” has largely been replaced by “Original of the Species”; the latter was a rarity in the spring but has become more of a staple in the fall. “Miss Sarajevo” has taken over the spot previously filled by “Running to Stand Still”. As for other additions, Joshua Tree hits “I Still Haven’t Found What I’m Looking For” and “With or Without You” have become regulars. Achtung’s “Until the End of the World” has started to appear frequently, and we also get many performances of acoustic takes on 2000’s “Stuck In a Moment You Can’t Get Out Of” and “The First Time” from 1993’s Zooropa. Are these changes an improvement? In my opinion, no. I preferred the more challenging setlists from the spring. Replacing the wonderful “Zoo Station” – my second favorite U2 song – with “Until the End of the World” isn’t a step up for me. “Until” is a good song, but it’s been done to death. “Zoo Station” offered a moment of real excitement for me, and I miss it. Also, the newer setlists rely more heavily on other tried and true numbers. Both “I Still Haven’t Found…” and “With or Without You” are fine tunes, but like “End of the World”, they’ve been played many, many times over the years. It’s a shame to lose more unusual songs just to get old warhorses. One thing has remained consistent is the length of the shows. 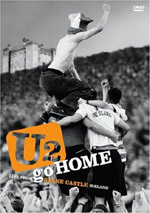 2005 finds U2 engaged in probably the longest concerts of their career. The shows regularly clock in around 135 minutes, so expect to get a lot of bang for your buck. As I noted earlier, I’ve seen the band 17 times during this tour. On one hand, my extensive exposure to the 2005 U2 tour makes me more qualified than most to judge the success of the Vertigo DVD. Who better to determine how well it represents the live experience than someone who knows it intimately? On the other hand, my extensive exposure to the tour makes me less qualified than most to rate Vertigo. Why the conundrum? Because I found it hard to evaluate the visual presentation on its own merits. As I watched the concert, I tended to fill in the gaps with my memories. If the cameras didn’t capture memorable sights, I didn’t notice this in a meaningful way because I had my own mental images. This may change in the future when the 2005 tour is less prominent in my mind. Because it’s only been two weeks since my last show, the concerts remained very active in my memory, which made it somewhat tough to let the video play on its own without mental interference. That said, I think Vertigo does capture U2 pretty well. I’ve noticed a mix of complaints about the DVD with which I don’t fully agree. Probably the most relevant one relates to the visual choices made by director Hamish Hamilton. He also handled the Elevation DVD and used very similar editing and camera choices there. Here’s what I said about Elevation: “Readers of my other concert video reviews may have noted my extreme disdain for gimmicky techniques. These attempt to “spice up” the presentation but they rarely do more than distract the viewer. “Elevation includes few of those issues. Some excessively rapid cutting does occur, but those examples match with particular songs. Aggressive songs like “New York” get more aggressive visual treatments. At times this seems a little busy and forced, but as a whole, it fits the music. I didn’t cut and paste these remarks simply because I’m lazy. I am lazy, but mainly I present them to make a point: if you liked the visuals of Elevation, you’ll like Vertigo. If you didn’t like the visuals of Elevation, you won’t like Vertigo. Both DVDs featured exactly the same patterns of shots and cuts, and they impacted on me in identical ways. Take that as good or bad if you’d like, but at least it’s consistent. Fans also have complained about the quality of the performances themselves. I can’t say I agree. I think the band themselves sound very good, as Edge, Larry and Adam attack the songs with vigor. Bono’s vocals are more hit or miss, but they’re consistently fine. Across the span of a tour, Bono will have some good nights and plenty of iffy nights. At this point in his career, the iffy ones probably dominate, but in a weird way, they add to his charm and effectiveness. For example, take the moment during “Elevation” when he can’t sing due to a frog in his throat. While some may see this as a problem, I think it humanizes Bono and gives the show a feeling of reality. I don’t want to see a perfectly seamless concert that comes off without a hitch. It’s more fun to watch something with all its warts on display. That’s what you get with U2, and Vertigo represents that. I doubt many will count it as one of the all-time great concert videos, but it represents the band’s 2005 tour with more than reasonable accuracy. It documents two good shows in a positive manner. 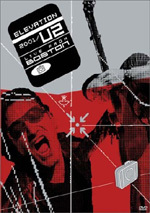 U2: Vertigo 2005 – Live from Chicago appears in an aspect ratio of approximately 1.78:1 on this single-sided, double-layered DVD; the image has been enhanced for 16X9 televisions. Since Hamish Hamilton directed 2001’s Elevation DVD and it looked relatively poor, I feared the worst for Vertigo. Although not a stellar presentation, it definitely improved on its predecessor. And it bettered another recent Hamilton DVD: the nearly unwatchable Mötley Crüe Carnival of Sin. Actually, the video quality of the latter was decent, but production choices marred the presentation. Some of those problems manifested themselves during Vertigo, but not to the same degree. Sharpness took the brunt of that impact. As with the Crüe disc, Hamilton favored quite a few intentionally out of focus shots. I suppose he felt these achieved some artistic merit and that “documentary feel”, but they just look ugly to me. Anyway, the rest of the show was concise and detailed most of the time, though some unintentionally soft shots occasionally occurred. I noticed no issues with jagged edges or shimmering, and edge enhancement caused no concerns. As for source flaws, I witnessed a little video noise but not enough to create a problem. Otherwise the show was clean. Most concert videos rely on lighting for the majority of their hues, and Vertigo was no exception. Is there some law that rock stars can only wear black on stage? Sure, there’s some purple to Edge’s shirt, but otherwise basic black is the order of the day. At least the light show enlivened things. Those hues usually looked quite dynamic and rich. Reds sometimes were a little runny, but I thought all the tones mostly appeared full and clear. Blacks also succeeded the majority of the time. A few shots displayed some muddiness, and I can’t say the blacks were consistently deep and dense, but they were more than acceptable. Shadows occasionally seemed slightly thick due to the shooting conditions, but they also remained more than decent across the board. This wasn’t a spectacular visual presentation, but it mixed its weaknesses with some real strengths to merit a “B”. When I examined the audio of Vertigo, I found two separate multi-channel soundtracks. We got a Dolby Digital 5.1 mix as well as a DTS 5.1 presentation. I didn’t discern massive differences between the two. I suppose the DTS track was a little warmer and more dynamic, but not to a substantial degree. While the picture quality of Vertigo improved upon the messy Elevation, I couldn’t say the same for the audio. The former was more than acceptable but not quite as impressive as the latter. Actually, I really had only one major complaint about the Vertigo tracks: the presentation of the drums. During quieter songs, the percussion sounded fine, as those elements offered appropriate balance and punch. Unfortunately, during louder tracks – ie, most of the show – Larry’s drums became buried in the mix. The audio favored Edge’s guitar to a much more substantial degree and the drums displayed a more rinky-dink tone. This varied quite a bit. At times the drums offered reasonable presence, while other numbers made them sound like they were recorded outside the arena. Most of the tracks weren’t badly off-kilter in this regard, but I did feel the drums needed to play a more active role in the presentation. Otherwise I found little about which to complain. The soundfield offered a good concert image. Stereo imaging was fine, though not outstanding. U2’s music doesn’t lend itself to a broad spectrum due to the limited number of elements. So many of the songs offered no instruments other than guitars, bass and drums that one side inevitably got left out of the display. Drums popped up in the center and guitar was usually in the left. With bass coming from the subwoofer, that meant the right side became somewhat neglected. The arena environment opened things up a bit, but that area still came across as a little underdeveloped. As for surround usage, it stayed primarily with crowd noise. The rear speakers bolstered the music to a degree, but the songs stayed mainly in the front. This wasn’t a showy soundfield, but it presented a good sense of the arena setting. With the exception of the small sound accorded the drums at times, the quality of the audio was quite good. Edge’s guitar was particularly impressive. His work rang and chimed with startling clarity and seemed very full and rich. Adam’s bass was also usually warm and rich, though I did have one small complaint. A couple of times during “Love and Peace or Else”, Adam’s bass should become really prominent in the mix. That’s the way it sounded live, and it works for the song. That didn’t happen here, as the bass level remained the same. It wasn’t a fatal flaw, but it undercut the song somewhat. Vocals were also well represented. Bono’s leads and Edge’s backups seemed smooth and concise. I noticed no edginess or issues with the singing, as they always displayed nice delineation. Overall, the audio of Vertigo failed to dazzle, but it usually sounded good. While both the Elevation DVD and the 2001 Slane Castle release included some good extras, Vertigo comes with almost nothing. Actually, there isn’t anything on the disc itself. The only extra comes from a 16-page booklet. It presents a few photos and some credits. It’s a totally uninspiring piece. U2’s 2005 tour won’t go down as one of their best excursions, but they remain a consistently solid and satisfying live band. Vertigo 2005 – Live from Chicago acts as a fairly good document of the year’s performances. I can quibble with some of the choices but I come away feeling pleased with it. Picture and sound are erratic but generally positive. Unfortunately, the set skimps on extras. Nonetheless, I like Vertigo and recommend it without reservation. Note that you can also buy a “Deluxe Edition” of Vertigo as well as this version. According to Amazon, the DE “comes in special packaging and includes a bonus second disc featuring a ‘behind-the-scenes’ documentary as well as other exclusive unseen performance elements.” As a U2 diehard, I planned to buy the DE – until I read some comments from others. I’ve yet to find anyone discuss the DE’s extras as anything other than mediocre to terrible. Since the DE retails for $13 more than this standard version, I’d definitely recommend you stick with the single-disc edition.